Isn't the article beneath wrong to interpret a Fully Amortized Loan as a loan with 7 years maturity? Isn't the correct comparator a Fully Amortized Loan with 30 years maturity, and 30 years amortization? How does the 30-year maturity Loan compare? Here are the numbers. Imagine you wanted to take on a $1,000,000 partially amortizing loan. You have a fixed interest rate of 8.5%. The bank agrees to give you a 7-year maturity with a 30-year amortization schedule. Your payment is going to be $7,689.13 per month. You'll end up paying $645,886.92. At the end of seven years, you'll owe a lump sum of $938,480.15, and you must repay the entire amount somehow or you'll default. The bank will seize the collateral and perhaps force you or the project to declare bankruptcy depending upon how it is structured. You'll end up repaying $1,584,367.07 total. In contrast, if you had a traditional, fully amortizing loan with a seven-year maturity [I emboldened. ], you would have paid $15,836.49 per month. You'll end up repaying $1,330,265.16. At the end of the term, you'll owe nothing. The balance is repaid in full. Why would someone opt for the partially amortized loan in this situation? 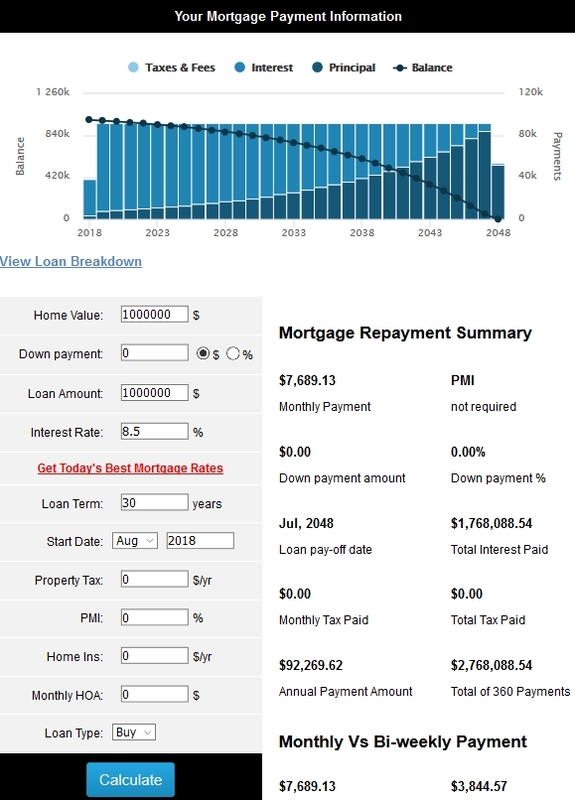 Despite the higher cost and the end-period liquidity demand, for 7 years, the borrower got to enjoy $8,147.36 more cash each and every month than he or she otherwise would have as a result of the lower monthly payment. Their examples adequately demonstrate the difference between partially amortized and fully amortized loans, especially since it's in the context of commercial lending, where 30-year terms are uncommon. The point is, if the amortization period is longer than the term then you have a partially amortized loan (balloon payment due at end), and if the amortization period is the same as the term then you have a fully amortized loan. Either can theoretically be used on a loan of any length. Decades ago in the United Sates is wasn't unusual to see these types of home mortgages. The mortgage amount was much lower back in the 1970's and 1980's, but at the time interest rates were very high. The advantage of the mortgage with the balloon payment in 7 or 10 years was that the risk for the bank was lower. The borrower has to either sell the house, refinance, or pay the balance. That shorter time period before getting a pile of money meant the bank could offer a lower rate. The gamble for the borrower was that the housing market might be poor which would make it almost impossible to sell; Home values could have dropped making it hard to get the price need to make the balloon payment; or interest rates could have risen making it hard to afford the refinanced loan. Keeping the amortization period at 30 years with the lower rate allows the homeowner to afford a bigger house. But like all the non-traditional mortgages that were popular in the 2000's ( no-documentation, interest only, lower interest for the first x years, negative amortization ) this made sense only if it was possible to address the problem by refinancing or selling a few years down the road when conditions were better. For most borrowers thinking about the balloon home mortgage they were comparing it to a 30 year traditional mortgage with a higher interest rate. If this type of balloon loan was being considered by businesses they could have been comparing it between a balloon in 7 years or a amortization period of 7 years. Not the answer you're looking for? Browse other questions tagged loans financial-literacy repayment amortization or ask your own question. What is the difference between an amortized loan and a non-amortized loan? What's an easy way to create a floating amortization loan?